Literary theory dictates that ghosts must exist for one of two primary reasons: to harvest negative energies or to herald important warnings, both usually directed towards ambivalent onlookers. The foundation of their existence can vary depending on a story’s tone, but almost always the root causes are the same –violent tragedies have left them in a state of otherworldly confusion. One of the more humorous ironies is that few characters contemplate those possibilities when they come face to face with such apparitions, often assuming that they are capable of only the worst fates. Perhaps the principles of some modern interpretations have violated those quintessential rules – the more seasoned architects believed that ghosts can only haunt, not attack or harm – but who is to say they could really be any worse than the living beasts that walk among us already? The reality is that they are byproducts of a world with much more menacing energies, and their refusal to leave is indicative of more singular agendas; they must endure for the sake of either redemption of vengeance, lest they be doomed to walk through eternity in a fog of aimlessness and despair. The story deals with the adult experiences of Edith Crushing (Mia Wasikowska), an aspiring writer of gothic horror fantasies whose bookworm routine is a result of lifelong isolation. An only child who lost her mother at an early age, she has plodded along in a state of cautious ambivalence. 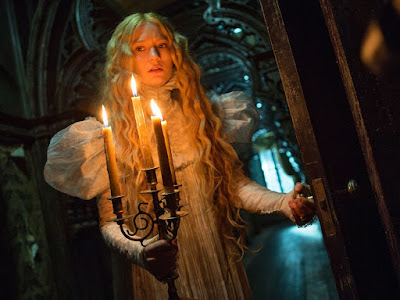 Some of that, we suspect, is due to a traumatic experience as a child, when a shadowy ghost figure she suspects belonged to her mother paid a startling visit to offer an ominous warning: “Beware of Crimson Peak.” What did it mean? The answers are yet to be clear to her, but this much she knows: ghosts are real, and they seldom occupy our space unless there are grave motives driving their foreboding silent prophecies. Much becomes clear when Edith passes into the life of Thomas Sharpe (Tom Hiddleston) and his sister Lucille (Jessica Chastain), strange entrepreneurs from overseas who have arrived in America seeking funding for an ambitious mining project. While the details of the sales pitch are vague, the passion is certainly not misplaced; sharp and oratorical Thomas believes intently in what he is trying to convey, even as would-be investors – including Edith’s stone-faced father Carter (Jim Beaver) – shed doubt on his underlying motives. Edith empathizes with the stranger, and he in turn finds something bewitching about her pure conviction. They share affectionate platitudes. She offers him a chance to read her manuscript. And then they engage in rather public pleasantries that more proper sorts look upon with shock and dismay (the scene of them waltzing while holding a candle stick isn’t just well-staged, it’s an effective conduit for suggesting their chemistry). And if you think that doesn’t add more fire to Carter’s own watchful agenda, then you just haven’t been paying attention long enough. Long story short: Edith is won over by Mr. Sharpe’s charms and is whisked away as his wife to London, where their abode, Allerdale Hall, rests atop a mound of red clay that is rich in fine minerals. What that also means – no doubt a convenience to Thomas Sanders, the production designer – is that much of the visual aesthetic relies on blood-red hues, because Sharpe’s mining venture requires him to dig through the soil and excavate its resources (we are shown vats of liquid red material in the basement, for instance, and the crimson soil stains ground snow so that it looks like an elaborate massacre). Meanwhile, Edith spends some quality time Lady Lucille, the chilly sister whose shtick is always to look distant and devious, even when she feigns nurturing qualities. What does she have to hide? The screenplay intentionally works in a circular fashion around her menacing presence, but of course it does; it is clear from the first interaction that her own secrets are at the core of the darkest truths of this crumbling house, and to know them too early would be a hindsight way too damaging to any of the momentum. The problem is that we are not exactly new to this rodeo. 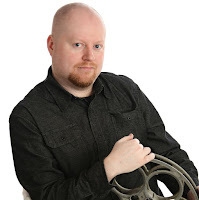 We have seen many a ghost story on the big screen over the years, and almost always there are the same quintessential details driving the dangerous impulses of one of the supporting characters, who are usually motivated by a sense of destruction interlaced with some level of perverse desire. If her cleverly-worded dialogue exchanges are not enough to indicate that particular narrative reality, then the presence of the actual ghosts sure make up for it; even early on, it is clear that they mean not to inflict pain or death on their newest arrival, but only seek to offer warning. And of course those warnings must translate into shrewd investigations in the second act, leading to masquerades and false conversations to abundant supply. That, I fear, is not accidental either – both del Toro and his co-writer Matthew Robbins clearly establish that they are only interested in telling us a straightforward story with all the obligatory twists and “gotcha” moments, because hey, even those formulas have yet to be seen in a structure this aesthetically exciting. There is something charming about that approach, and at the same time maddening. We are never surprised or shocked at a single thing that gets worked into the frame. When the reveals happen, they aren’t exactly earth-shattering epiphanies; the dialogue’s suggestive tone won’t let them be. And because the picture’s technical values are something of an artistic revelation, it only aggravates our natural cynicism. With a movie that looks this great, why is del Toro holding his narrative back in the throes of convention? It is not a sound impulse, especially given how one correlates to the other. Sure there are great stretches of exposition going on here. Sure, the characters are convincing conduits for the screenplay’s devious methods, and sure there are some rather top-notch performances extracted from the leads (Jessica Chastain in particular is thoroughly disarming). But where is the vision? The novelty? In a road map to a point that contains some of the most distinctive visual stops of any movie you will probably see this year, how sad is it to realize, rather early on, that the final destination plays like it was created in the remnants of a recycled imagination.